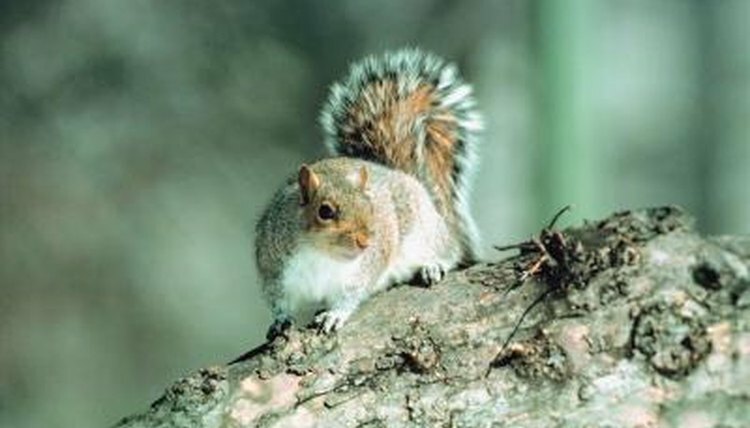 Eastern grey squirrels (Sciurus carolinensis) are mid-sized creatures that hail from North America, specifically in eastern portions of the United States, as their name communicates. These tree squirrels also have been brought to areas outside of North America, namely Great Britain, Italy and South Africa. They are commonly referred to simply as "grey squirrels." Other names for them are "migratory squirrel" and "cat squirrel." These diurnal rodents adjust easily to new types of environments, although they are especially common in woodlands and forests. They also frequently make appearances in places with high human presences -- think urban parks and yards of residences. Grey squirrels generally den within trees, but also build nests out of foliage in the absence of any suitable hollows. Their population is high and increasing, notes the IUCN Red List of Threatened Species' 2008 analysis. As a result of those strengths, they are "least concern" animals with regard to possible endangerment. They bear litters one or two times annually. The average life span of grey squirrels is extremely brief -- generally only between 11 and 12 months, according to the Smithsonian National Museum of Natural History. Despite this brevity in life expectancy, some free roaming grey squirrels have actually surpassed 10 years in age. A single female grey squirrel that resided in a captive environment greatly outlived the typical life span of her species, making it to over 20 years old, reports the University of Michigan's Animal Diversity Web. Although grey squirrels are hardy mammals, many different things can affect how long they survive. Some of these things include the harshness of the winter months and sustenance availability -- their extremely diverse meal staples include beechnuts, acorns, bugs, grapes, bird eggs, birds, grass and amphibians. Grey squirrels sometimes even display cannibalistic tendencies, feeding on members of their own species. Predators, too, can affect grey squirrel life spans for the worse. Some of the critters' biggest predator threats are coyotes, red foxes, weasels, grey wolves, hawks and bobcats. Lastly, parasitic infections can negatively affect their survival, as they can sometimes trigger extensive loss of fur -- a serious wintertime hazard.